•	Marcus Type TPOA three-phase auto transformers provide a quick and simple way to convert standard supply voltages to those special voltages required by small loads and fractional motors. 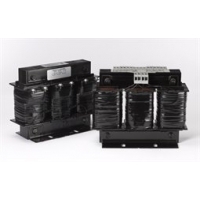 •	These compact open-type copper transformers are Y-connected and are fitted with clearly labelled fiberglass terminal boards with solidly fixed connection studs for easy installation. •	Unlike the use of multiple unit buck-boost arrangements, there is no complicated internal wiring necessary and no conversion charts to decipher. •	As with all auto transformer installations, the loads are not isolated from the line source and caution should be exercised when there are electronics or computer controls present. •	Available in a full range of voltage combinations up to 3KVA.